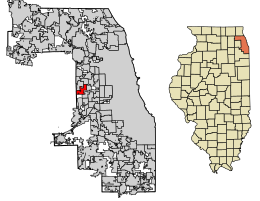 Location of Westchester in Cook County, Illinois. Expansion has consumed nearly all open land within the village, save for the 85-acre (340,000 m2) Wolf Road Prairie. It is the largest black-soil prairie remnant east of the Mississippi River. Westchester is located at 41°51′14″N 87°53′1″W﻿ / ﻿41.85389°N 87.88361°W﻿ / 41.85389; -87.88361 (41.853890, -87.883712). According to the 2010 census, Westchester has a total area of 3.69 square miles (9.56 km2), all land. It shares its Western border with Du Page County. As of the census of 2010, there were 16,718 people residing in the village. The racial makeup of the village was 65.9% White, 14.1% African American, 0.1% Native American, 3.9% Asian, 0.1% from other races, and 1.0% from two or more races. Hispanic or Latino of any race were 14.9% of the population. Westchester is divided between three congressional districts. The areas south of Cermak Road or west of Haase and Burns Avenues are in Illinois' 3rd congressional district; nearly all of the areas east of Mannheim Road and east of Mayfair Avenue between Canterbury Street and Dorchester Avenue are in the 7th district; the area in between (primarily Oak Ridge and Glen Oak cemeteries) is in the 4th district. Westchester is home to Westbrook Corporate Center, located at Wolf Road and Cermak Road. Constructed in 1986 and renovated in 1996, the complex consists of five 10-story towers encompassing more than 1 million square feet (90,000 m²) of office space. Westbrook Corporate Center has won the 2000/2001 BOMA- International Office Building of the Year Award, 2000/2001 BOMA- North Central Region Office Building of the Year Award, and 1998/1999, 1999/2000, 2000/2001 BOMA- Suburban Chicago Office Building of the Year Award. Proviso Township High Schools district serves high school residents. Zoned students attend Proviso West High School in Hillside. Westchester residents may apply to Proviso Math & Science Academy in Forest Park. ^ "Profile of General Population and Housing Characteristics: 2010 Demographic Profile Data (DP-1): Westchester village, Illinois". U.S. Census Bureau, American Factfinder. Retrieved March 20, 2013. ^ a b "Links & Contacts". 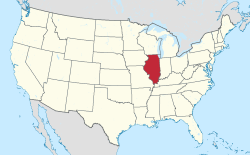 Village of Westchester, Illinois. This page was last edited on 3 March 2019, at 21:43 (UTC).